SnowmanAlto’s Adventure is a game full of colour. The sequel to the critically acclaimed “Alto’s Adventure,” called “Alto’s Odyssey,” released this month after almost three years of development. The game builds on its predecessor’s mechanics, but expands on them significantly while still maintaining the soul of the original game that players fell in love with. The resulting game, “Alto’s Odyssey,” might just be the best iPhone game around, if not the best mobile interactive experience outright. When “Alto’s Adventure” was first released in February 2015, expectations among its developers weren’t high, and there was little beyond hope that their hard work would pay off. That’s why Team Alto – the group formed by people from the Toronto-based developer Snowman and others like the British artist and programmer Harry Nesbit – faced a much bigger challenge when it came to doubling down on that success with a sequel. The idea behind the original “Alto’s Adventure,” at least in terms of gameplay, was rather simple and straightforward. “Alto’s Adventure” is a 2D, automatically side-scrolling platformer, set in an endlessly descending mountain full of rocks, chasms, ropes to grind on, and so on. As the character progresses automatically, you only need to tap the screen to jump, or hold your finger on the screen to perform a backflip. That’s it. 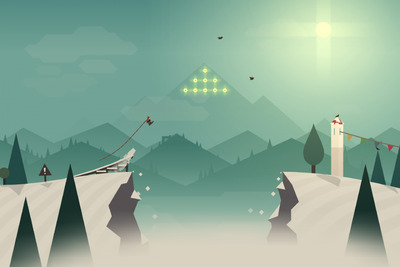 The game starts at what seems to be the top of a mountain, with Alto (the main character) and his llamas gathering around a fire. When the llamas escape, Alto grabs his snowboard, and the journey begins. As mentioned, there is no real end to the game, in the sense that the mountain never finishes – until it does. 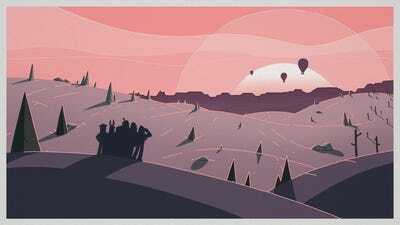 In a telling promotional image published on the developer’s social accounts, we can clearly see that Alto and his friends – the other characters you unlock throughout the game – sit at what seems to be the mountain’s valley, gazing at the canyons and hot-air balloons beyond the horizon. Cymet said that “a sense of home” created a safe barrier for exploring these uncharted territories, both in and out of the game. Home, he said, was not meant as a single, physical place, but rather a state of mind that can be brought from place to place – so long as your friends and family are with you. “Alto and friends start at the top of the mountain in a comfort zone of sort, but as they move to this new, wilder, crazier, ridden desert, they value the theme of exploration while keeping the idea of home,” Cymet said. And that is exactly what “Alto’s Odyssey” feels like when you play it: A familiar experience submerged in a new and much larger world. “Alto’s Odyssey” is meant to feel like an evolution of “Alto’s Adventure,” not a complete overhaul. Edoardo Maggio/Business Insider (from Alto’s Odyssey)Some moments are just absolutely breathtaking — fortunately there is a dedicated ‘photo mode’ that allows you to pause the game and take a shot. 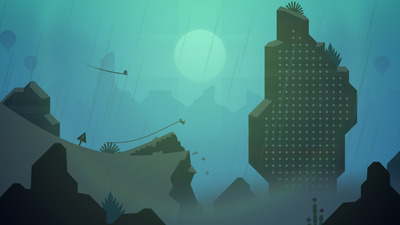 Team Alto did play with some new gameplay ideas, like introducing a grappling hook, but ultimately decided against them, as it was paramount that the original formula kept working. The formula is the game, after all – and that’s a big reason why the producers chose not to call this game “Alto’s Adventure II.” The new game had to feel like a natural evolution, as opposed to a fundamental rethinking of what an “Alto” game should be. SnowmanWaterfalls and wells are among the new things you will see in Odyssey. The game’s evolution is subtle but tangible because of two elements: The new “biomes,” and the myriad of little objects scattered throughout them that make “Alto’s Odyssey” feel like a much richer and more vibrant game. There are three biomes, or explorable areas, in “Alto’s Odyssey”: The desert dunes, the temple city’s ruins, and the canyons. Each area differs from the others, both aesthetically and in terms of gameplay, offering exclusive feats like hot-air balloons to jump on and walls to grind on. These elements change how your character moves, the pace and speed of the game, and offer unique twists in each level. With so many diverse environments that constantly change, “Alto’s Odyssey” is often more difficult, challenging, and fun than its predecessor, while still maintaining a general level of accessibility that makes it fun for everyone. Edoardo Maggio/Business Insider (from Alto’s Odyssey)Canyons are part of the new biomes. The differences as you progress aren’t just visual, but mechanical – only specific elements will show up within specific biomes. “That approach required us to virtually triple the amount of assets we were producing, and item zones we were creating to place content in the environment, and expanding scope in that way really did force us to almost fundamentally rewrite the way that we create the environment,” Cymet said. It’s not just a game to play, but a place you can go. Edoardo Maggio/Business Insider (from Alto’s Odyssey)In Zen mode, you can afford to lose and then keep playing; the game won’t ask you to start over, it only ends when you want to. The feeling of immersion was the case in “Alto’s Adventure,” and it holds true in “Alto’s Odyssey,” thanks to the gorgeous scenery and the hypnotising soundtrack scored by the British composer Todd Baker of “Monument Valley” fame. Torin Borrowdale composed a special second track for the game’s second mode, the immersive “Zen mode,” which was a feature carried over from the first game that makes it impossible to lose. Several elements are removed and you can just get lost in the scenery for as long as you want. In this, “Alto’s Odyssey” is strongly reminiscent of PlayStation hit “Journey,” another game that strikes a fine balance between a game and art. But with “Alto’s Odyssey,” the main mode is the game itself, while Zen mode feels like creating an endless painting. The new world has undergone massive changes under the hood, which make Alto’s Odyssey even more impressive. The technical feat that allows Alto’s world to keep popping up automatically as you slide through the dunes is something called “procedural generation,” a technique that allows data to be created algorithmically as opposed to manually. But that doesn’t mean that the game created itself, or that it’s just a copy-and-paste job of the original title. “There is a misconception that when a game is procedural, you just click the ‘procedural button’ and everything aligns in perfect order, and random things appear and look beautiful,” Cymet said. A big part of Team Alto’s success comes from making careful decisions about pricing and platforms. 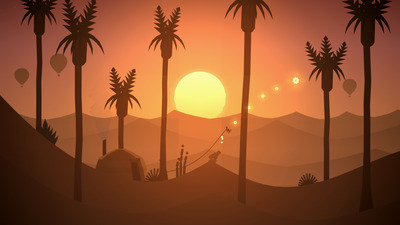 “Alto’s Odyssey” is a one-time purchase to play: £4.99 in the UK, and $US4.99 in the US. “Alto’s Odyssey” works best without in-app purchases (IAPs), the developers said, although they did clarify that microtransactions aren’t bad by themselves; their implementation should match the game’s design. 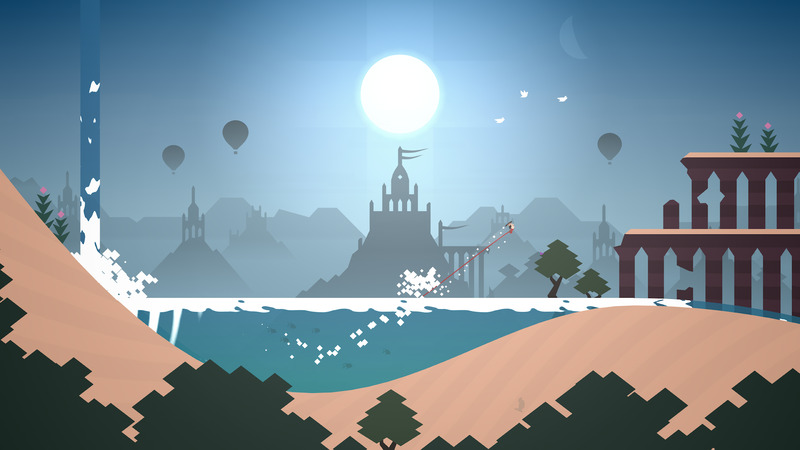 But “Alto’s Odyssey” is an Apple-only game for now (on iPhone, iPad, and Apple TV). An Android version is scheduled, but it won’t come for some time. There are several benefits to being an “Apple-first” game. SnowmanThe dotted walls allow you to grind; a new game mechanic that changes the flow’s pace and requires mastering to be properly taken advantage of. When asked whether developers give Android a “B-list” treatment, Cash said “that is often the case, for a number of reasons,” like how easier it is to develop on Apple platforms, or the piracy issues Android is still often plagued by. For a game that doesn’t rely on more secure, harder-to-bypass IAPs, going Apple first “is a no-brainer,” studio cofounder Ryan Cash told us. Then there’s all the bonuses being an exclusive iOS app can give you, like a front-page story in the popular “Today” tab in the App Store, tweets from high-up executives like Phil Schiller, and a general pre-launch buzz on the media. “Alto’s Odyssey” might just be the best mobile game out there. Whether “Alto’s Odyssey” will be as successful as its predecessor is impossible to say, but the pieces are all in place. 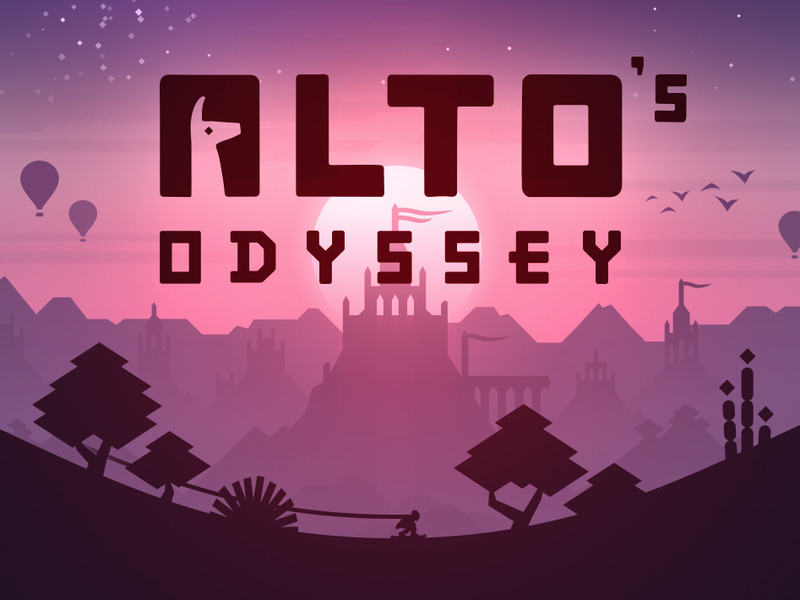 As a pure gaming experience, “Alto’s Odyssey” will feel instantly familiar to those who have played the original title. It’s still the same game – automatically moving in an infinite environment from left to right – and the feel of the game has gone unchanged, too. The result is a constant, smooth flow where the pace only changes depending on the character you select (some characters are faster, while others can perform acrobatic feats better). And so, “Alto’s Odyssey” is everything its predecessor was, and then some: More fun, more challenging, more beautiful to look at and to listen to, while remaining enjoyable for quick, one-hand runs on the tube or longer, more relaxed sessions sitting comfortably on your house’s couch. And based on what Cymet told us, perhaps there’s hope for a third entry in the Alto series. “As long as we feel that there is the right set of feelings to explore, the right reasons, and the right story threads to tag on, we would want Alto to continue into the future,” he said.